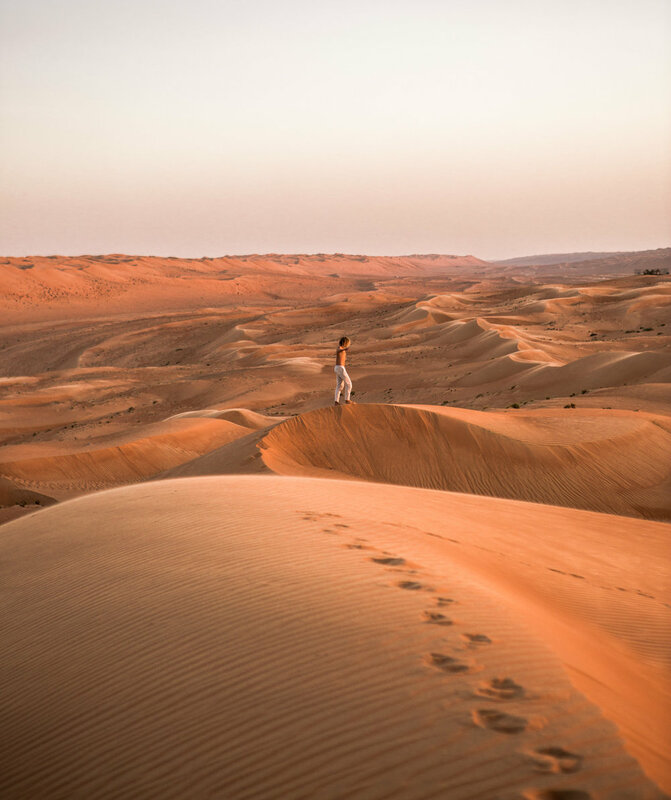 Our time in the Middle East was not over, as we hesitantly entered the country of Oman. After researching for weeks and finding very little traveller photos online, my thoughts were naturally, "are we wasting our time & money on exploring this part of the world with a possible outcome of not creating new and exciting content". Boy was I so wrong! It would not have been the trip it was without my fav people in the world Elliot & Jaxon. Took a little convincing, but the boys were finally on board and we had a crazy unforgettable week lying ahead of all of us. Just missing one piece of the Neverland puzzle, and that was Zac. If you don't already follow these boys, you should! And right away! 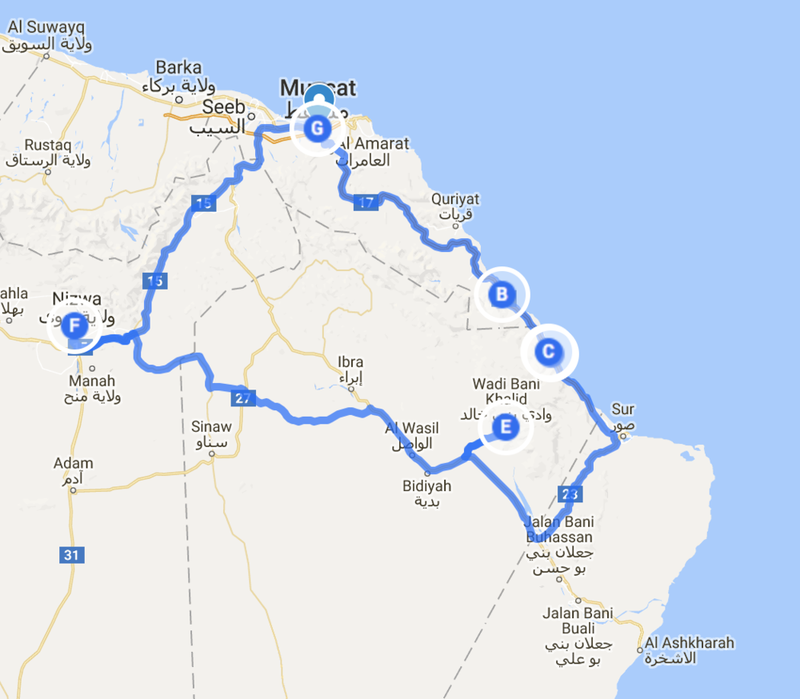 Our one week route around Oman. You can click on the link below to find out more. 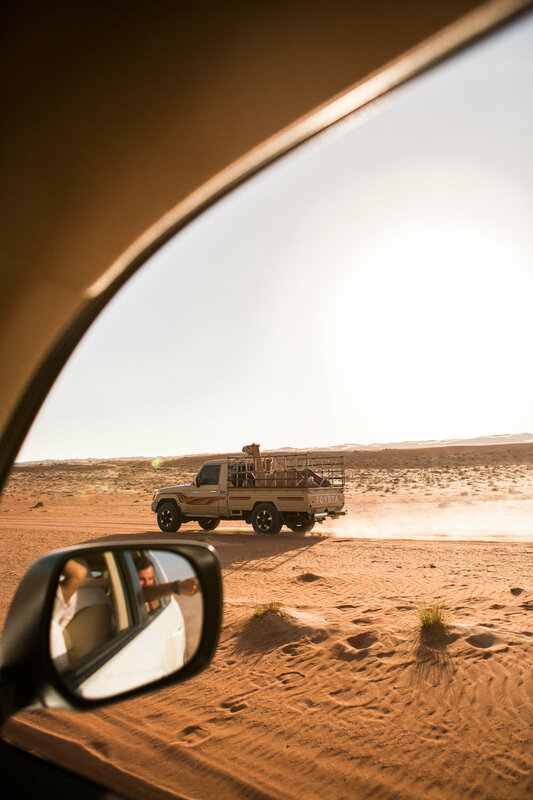 One thing we discovered after weeks of research, was that the best way to explore Oman was in a 4X4 & to free camp every night. With that plan in mind, we very questionably signed off for a almost too perfect FWD in the Airport carpark, and set out to the beaches south of Muscat. Finding a spot to camp is surprisingly super easy along the coast line there, where we spent our first two nights right on the beach! 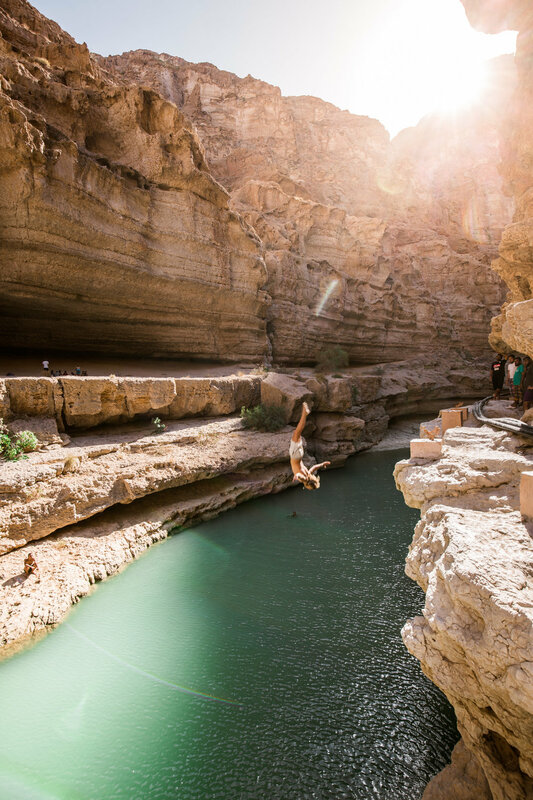 From there we explored the Bimmah Sinkhole, Wadi Shab, and the local hospital. Yep, thats right, the hospital haha! After Jacko (and Elliot) charged it off the top of the Sinkhole and popped his shoulder out, we had to scout out the nearest hospital. 2 hours, and 3 hospitals later we found a doctor who could help put his shoulder back into place, and all was new and good again! 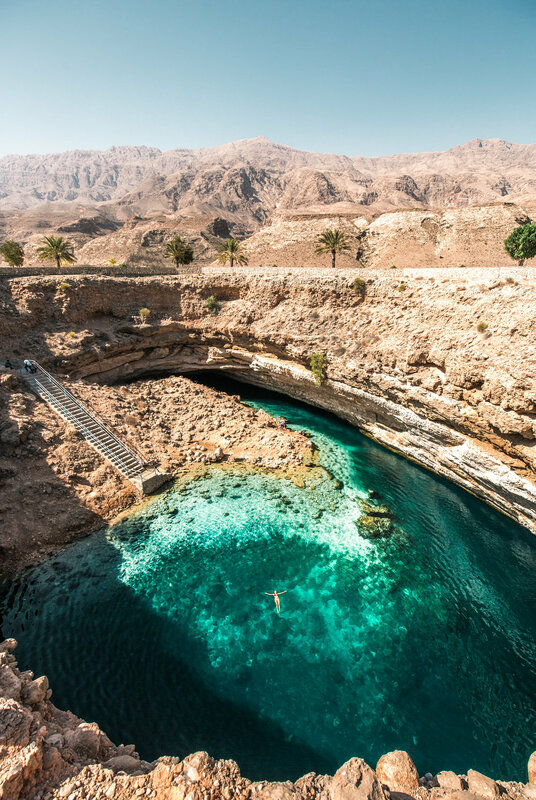 The Bimmah Sinkhole is an extraordinary natural phenomenon that you must not miss on your road trip through Oman. It is super easy to find and a great place to stop and take a dip in the extreme heat. And when I say extreme, I mean extreme! Quite possibly the hottest place I've ever been. One second out of the comfort of your air-conditioned car and you'll be sweating in places you never have before haha! 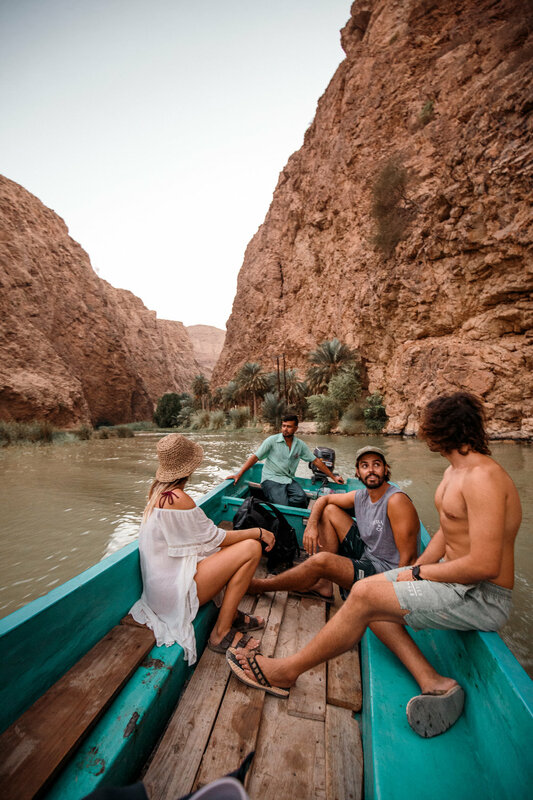 After we got Jackos arm back into shape, we spent the rest of the afternoon exploring Wadi Shab, which is a short drive from Bimmah Sinkhole. With sweat in our eyes, and fear for Jackos arm popping out again, we set foot into what looked like Jurassic Park. Quick tip, try not visit on a Friday or Saturday because locals seem to flock here - and if you are a woman there is a high possibility you will get vigorously stared at, even unexpected photos taken of if you when your not looking. My only negative experience in Oman was this day! Apart from that, I absolutely LOVED the landscape and the aesthetic of it all! An incredible tropical oasis lined with palm trees and turquoise water. Make sure to follow the canyon the whole way down to the hidden cave and waterfall. Incredible! After spending the night on the coast again, we took off early in search for the next Wadi! A few hours inland, and we reached another amazing Wadi called Wadi Bani Khalid. We visited on a Sunday, which seemed much quieter than a Friday or Saturday, and for that reason I enjoyed my time here a little more here. This gem possesses some seriously blue water holes! I just remember giggling so hard as I let all the little exfoliating fishies gently nibble away at my tootsies. I think there must have been a hundred on me at once! So much fun! I'm half way through writing this post, and I'm getting all emotional thinking of how much fun we actually had! An unexplainable amount of laughs and mishaps along the way. All making it that much more memorable! 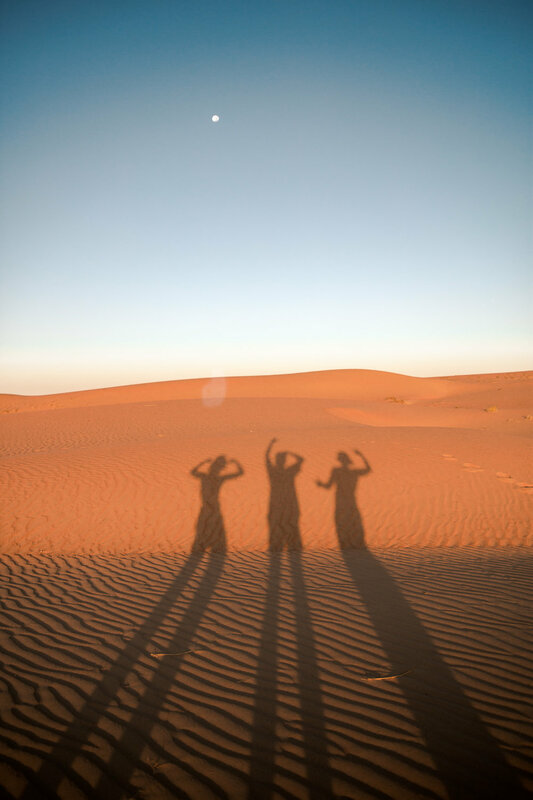 After our skin had turned white and wrinkly from swimming for too long, we packed up and headed straight for the desert for a night. Away from all civilisation; just us, and the milky way (oh and the full moon that decided to rise as we were taking long exposure shots! haha way to ruin the shot moon!). 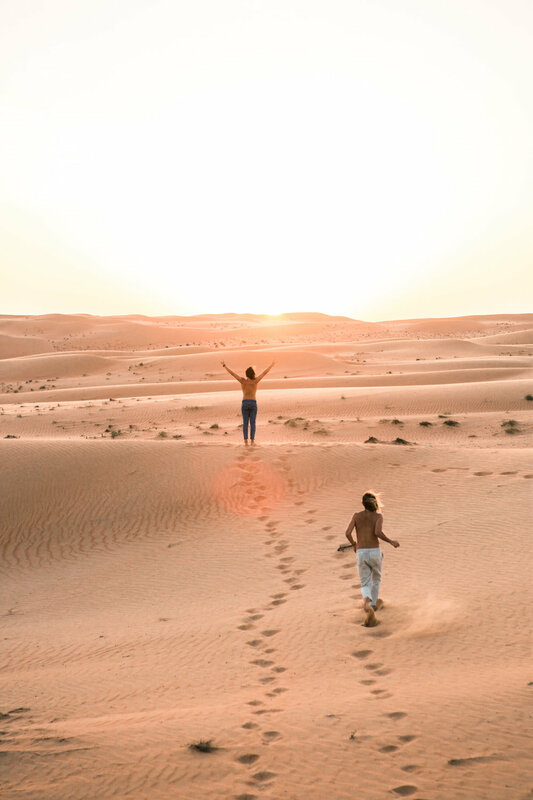 Wahiba Sands is small desert a couple hours south from the Wadi where you can adventure into on your own (in a 4WD of course) and set up for the night anywhere you dam well pleased. As I said before, a few mishaps along the way, including getting seriously bogged in the middle of desert with NOBODY around!! 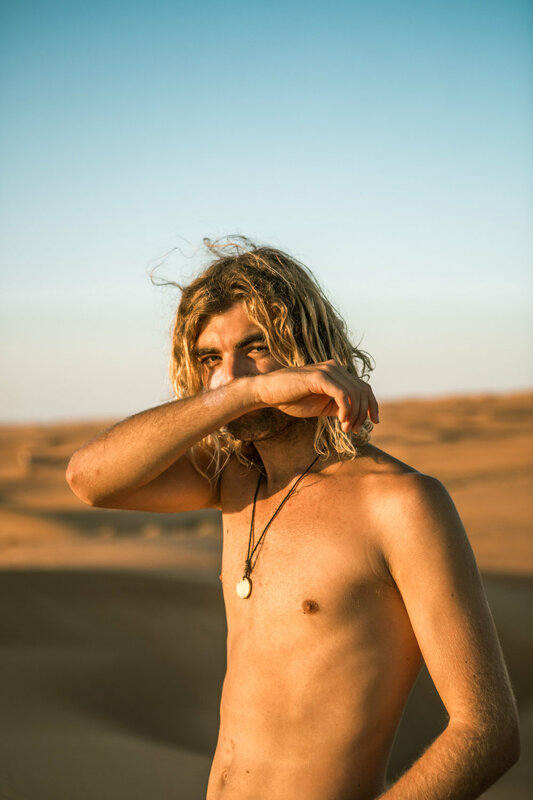 After spending faaaar too long playing with some stray camels we passed along the way, we got a little too excited and went guns blazing into the dunes. Im guessing you can picture what happened next right? HAHAHA still makes me lol to this day! Our wheels were almost completely buried in the sand, and we spent the next hour or so trying to dig our way out of it! With almost completely missing sunset, Jacko did the unimaginable and got us FREEEE from the extremely dangerous situation we had stupidly got ourselves into. 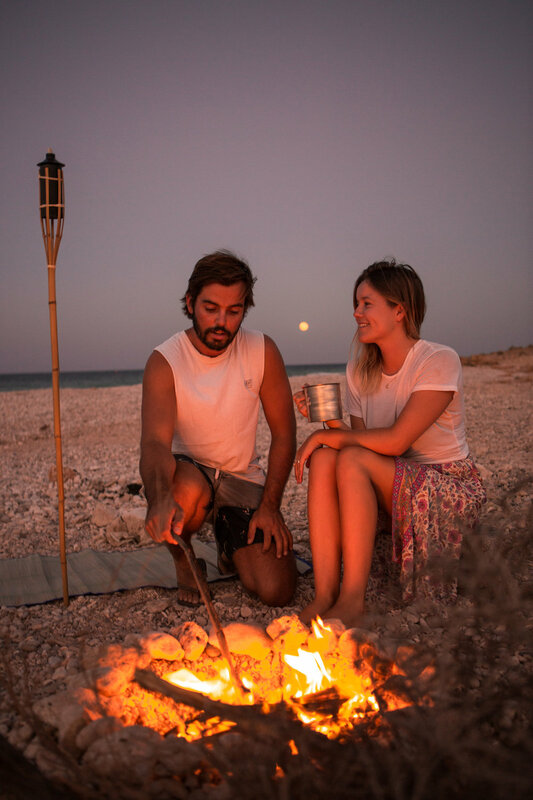 After that we all made a fire, cooked dinner, told ghost stories and fell asleep under the stars. Our next stop off on the map was Nizwa to check out some of the fairytale castles and forts. We spent a couple of hours within the castle walls of Nizwa Fort, which is apparently one of the biggest tourist attractions in Oman. This really took me by surprise as we were literally the only ones in there! Just goes to show how little tourists actually visit Oman, which is beyond bizarre at it is so beautiful. In saying this, I hope that my images have inspired you all to add it to your bucket list of travel destinations. Which so many of you have messaged me saying you already have! YAY. That night we planned to take a scenic sunset drive up in the mountains eventually setting up camp in an epic spot. BUT somehow we managed to kook it again by driving ourselves an hour in the wrong direction haha! By this stage we were exhausted, hadn't taken a proper shower in a few days & were running out of options on where to stay for the night. Kyle and I called it quits on our dream of free camping every night, and booked a stay at a hotel. Not to worry though as Elliot and Jacko kept the dream alive by setting up camp in a pretty epic location! Check out our sunrise photos we shot below.. When I thought this country could in no way surprise me anymore, we spent our last day island hopping in what felt like Greece, or the Maldives. Certainly not 30 mins off shore to a hot desert land! These little clusters of paradise are called the Dayminiyat Islands, and are just off the coast of Muscat. 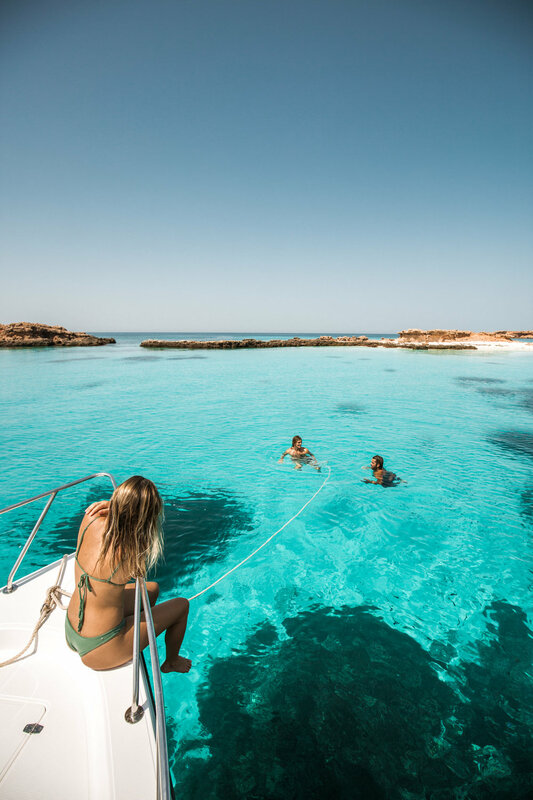 Here you can explore tiny white sand beaches, swim in some of the seas most crystallised blue waters, and snorkel alongside some impeccable sea life. We were lucky enough to see a few sea turtles and stingrays. Apparently some days you can even swim with whale sharks! I know right! My mind was blown when a lady on our boat told us she had swam with a pod of 30 only a week beforehand! 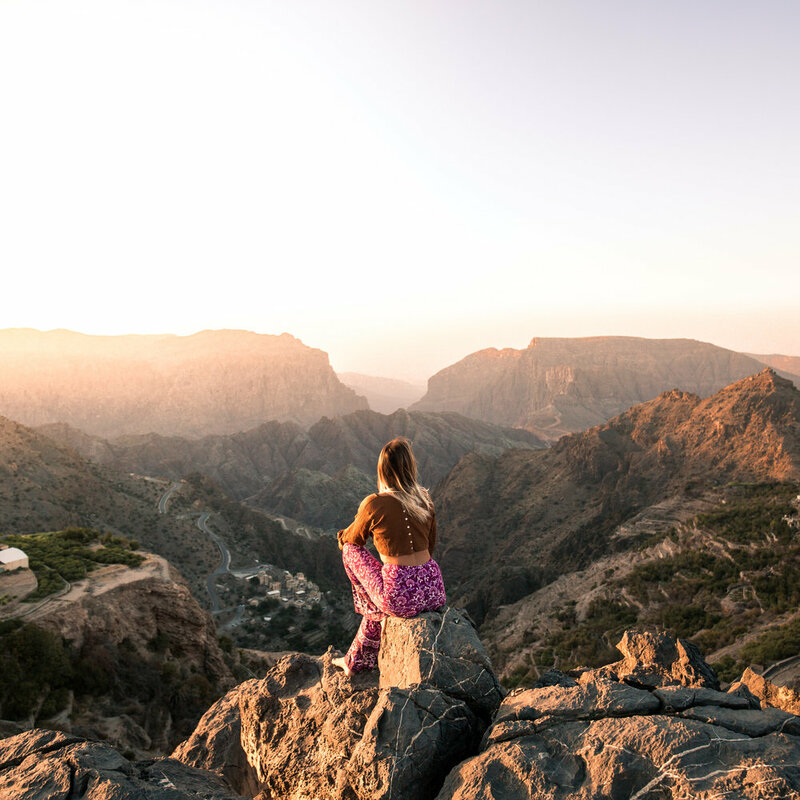 If you are only doing a short trip in Oman, I recommend you do not miss this day trip off your list, especially when its so accessible from the capital city. You can book trips through http://www.daymaniat-shells.com for a very reasonable price. We paid $70 for a half day snorkelling trip; which included all your snorkel gear, fruit and drinks. 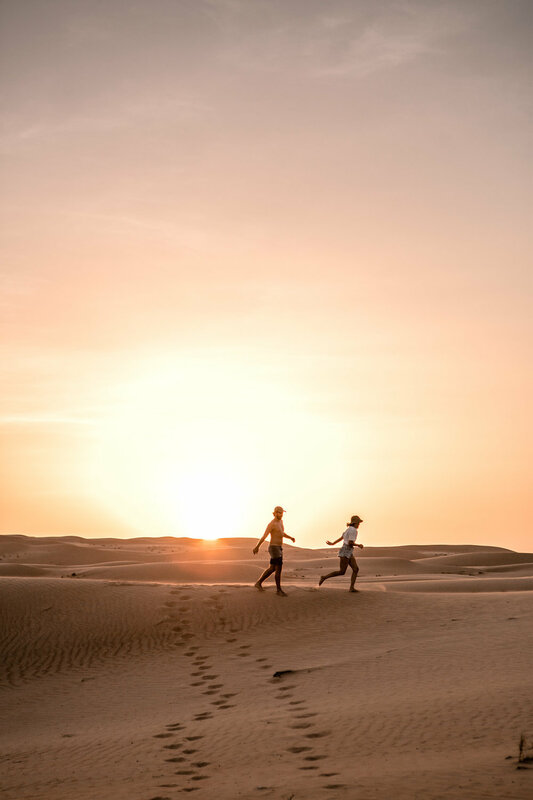 I can not believe we questioned our decision to explore this incredible country! I am dying to go back and visit the south in Salalah and even the far far North where there are Fjords! Who, after reading this, has now added it to one of their bucket list destinations? Let me know in the comments! For anyone who comments I am giving you guys a little surprise.. For those who have read all the way to here!